The Ark Encounter project is moving. Even though no dirt has been moved since the $150 million project was announced in November, there’s been much activity, mostly getting agreements signed, property purchased and data gathered. The project, which will involve a full-scale wooden replica of Noah’s Ark, as well as a bird sanctuary, a biblical village and animal shows, is on track for a ground breaking ceremony in late summer. Will Ark park cost taxpayers’ money? What will the cost of the Ark Encounter be for Grant County? To date, the project, which is estimated to bring more than 900 full and part-time jobs to the community, has cost a little bit of money, a 100-acre piece of property, some cooperation and a lot of time. 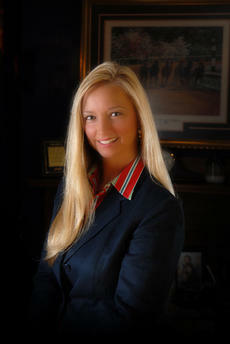 Part of my full-service package as a Realtor is offering decorating, design and staging advice to my clients. There are several basic suggestions I have for sellers when listing their homes. Some of them involve pets. I love animals–I have four dogs (two outside, two inside), plus a grand-dog named Gus who visits from Lexington. Gus is a 6-month old Labrador that’s as big as a 6-year-old kid. Bella and Barkley are my two little Yorkies that live in the house with us. Or, I should say, we live in Bella and Barkley’s house! It’s that dead time of summer that parents and grandparents fear - mid-point of summer vacation. That’s right, there’s just about four weeks left before the school bell rings and students return to Grant County and Williamstown for the start of the 2011-2012 school year. You’ve swam in the pool, you’ve rented a bazillion movies, you’ve been on a vacation, your wallet is empty and so is your patience level. What should you do? Grant County Martial Arts is kicking and punching in to its 20th year of business. The martial arts school in Dry Ridge teaches Shaolin, Tai Chi and in the fall basic mixed martial arts will be offered. Daniel Lester, the previous owner, passed Grant County Martial Arts to its second owner, Kevin Brandenburg in its 19th year of business. Brandenburg has owned the martial arts school for a little over a year and is a Sifu, or teacher, at the martial arts school. He has been with the company for 13 years and is a second degree black belt. Paws will be running through the grass and digging in the dirt soon at the Grant County Animal Shelter. Eight large play areas are being built to accommodate the adult dogs at the shelter, which means they will stand a better chance to find a permanent home. “Play yards makes the dogs more adoptable because it’ll allow them to exercise and they won’t be as excitable when people come to look at them,” said Marsha Chaney, animal shelter director. 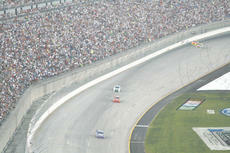 A historical event like the NASCAR Sprint Cup Series can have an impact for miles, not just around the track, but also for an impact in the local economy. Grant County felt the impact at the hotels and restaurants, as many were booked in advance of the race, some just an hour and a half after the announcement last year. 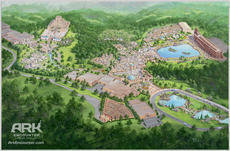 After some intense questions and some tense moments of silence, Williamstown’s city council voted in favor of entering into a Memorandum of Agreement (MOA) with the Ark Encounter. Mike Zovath, senior vice president and Jim Parsons, attorney, for Answers in Genesis, the developer behind the Ark Encounter, came to the July 5 council meeting to assure council members that their approval of the agreement didn’t obligate the city financially, but would allow the project to continue to move forward. Numerous tents selling fireworks popped up in Grant County, including many in Dry Ridge, as buying bigger, aerial fireworks became legal in Kentucky. The General Assembly passed a law during the 2011 session allowing they sale of class C (1.4 G) fireworks, such as bottle rockers, Roman candles and fire crackers in the state. 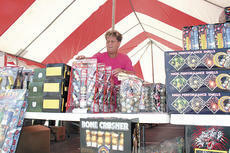 Dry Ridge resident Rex Benson of Big Rex’s Fireworks said the law change is a win-win situation. If the Jonesville Post Office closes, Arbidella Richardson is afraid for the town she’s called home for many years. “When you lose your post office, you lose your town,” she said. In an effort to trim its budget, the United States Postal Service has closed small, rural post offices across the country and the Jonesville location could be next. Postal officials have scheduled a meeting at 6 p.m. on Tuesday, July 12 at the Jonesville Fire House to discuss the issue and hear from residents.